KRALENDIJK, 22 June 2018 - This morning, Lieutenant Governor Edison Rijna granted the 100th Microcredit of Qredits Bonaire to entrepreneurs Phenice and Revello Frans. With this loan they can realize their growth ambitions for the company 'Davana Holding B.V'. Qredits has been active on Bonaire since 2015. Starting and existing entrepreneurs can apply for business loans up to $ 50,000 to start or invest in their business. Lieutenant Governor Rijna handed over a symbolic check this morning to the entrepreneurial couple Phenice and Revello at the Konfó local restaurant. Mrs. Phenice is a local entrepreneur who knew from an early age that she wanted to become an architect. Together with her husband she finally took the next step; her own interior decorator's office now is a fact. With the Qredits loan she will buy inventory, furnishing and machines for the company. 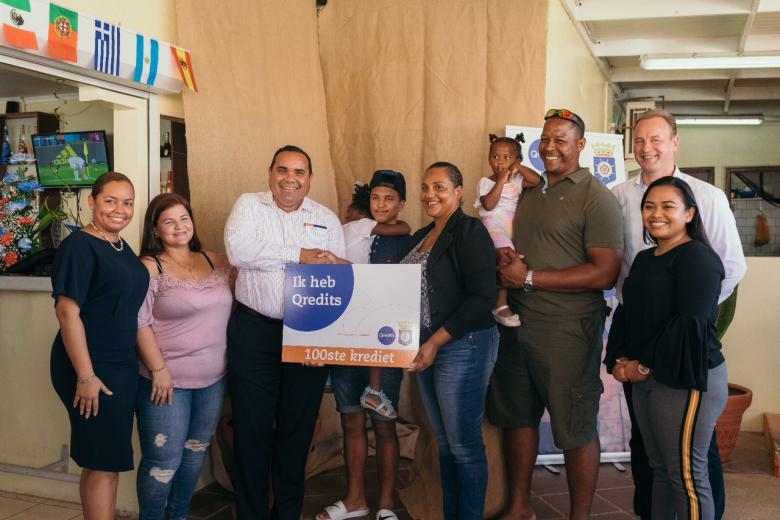 Qredits Bonaire aims to strengthen entrepreneurship on Bonaire by offering microcredit loans up to $ 50,000 to (starting) entrepreneurs. They also offer mentoring, providing a sounding board and practical advice to local entrepreneurs. Qredits started the Bonaire branch at Kaya Amsterdam 23, Kralendijk in the fall of 2015. Since then many loan applications have been submitted to Qredits and 100 have been financed. The companies are very diverse, from local fishermen to clothing stores, from a juicebar to a nice restaurant. Each one of them had difficulty obtaining financing and were just looking for that extra helping hand. Qredits also offers support with writing a business plan. The free e-learning How to write a business plan is available in three different languages or one can participate in the EigenBaas Evening classes.